The Gospel Coalition | Los Angeles > Inspire. 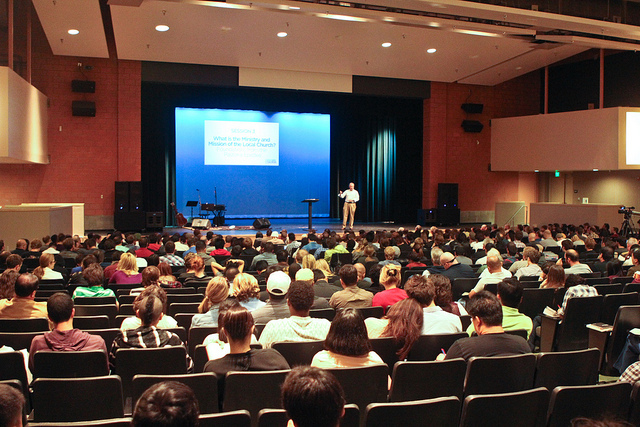 Every two to three years, we host a large, one- day conference featuring a well-known and gospel-centered speaker. This conference exists to galvanize pastors and churches across Los Angeles with a renewed vision for gospel-centered ministry in our city. As we walk away inspired by the riches of the gospel and our mission in Los Angeles, we will be primed to continue spreading the gospel in our churches and our city. In 2010, TGC LA hosted a one-day conference for Los Angeles pastors with D.A. Carson. Reality LA secured their Sunday meeting location, Helen Bernstein High School in Hollywood, and graciously provided volunteers to help with parking and seating. Over a thousand pastors, leaders, and church members gathered to hear Carson speak on “What is the Gospel and How Does It Work?” in three plenary sessions. During a break for lunch, Carson sat down with interested pastors and relayed his vision for local chapters of The Gospel Coalition. The day closed with a text-in Q&A with Carson, moderated by P.J. Tibayan (CrossView Church) and Tim Chaddick (Reality LA). Pastors and leaders left encouraged and galvanized to pursue the spread of the gospel in their churches and their city.